~ Fine letterpress and intaglio printing. The Diana Gabaldon keepsake for the NWS event in Traverse City, July 7, 2014. A little update after last nights event. I don’t always like meeting authors or listening to them speak in public about their work but this was an exception. Diana is a genuine and real human being that, despite her amazing and deserved success, came off with wit and honesty about her process and was very engaging to the audience. She also liked the broadsides and was pleased with the additional copies I made for here on the nicer paper stock. It was a capacity sold out crowd at the Traverse City Opera House. I arrived late (of course) and was stunned to see the line for the door wrap around the block – that doesn’t happen in Northern Michigan very often. We got in, delivered the broadsides and settled for balcony seats which was pretty much all that was left. I always feel a little bad about the extra printed items I make for these events as then it is just one more thing that the author might be expected to sign but Diana was very gracious and stuck it out until the end of the line. 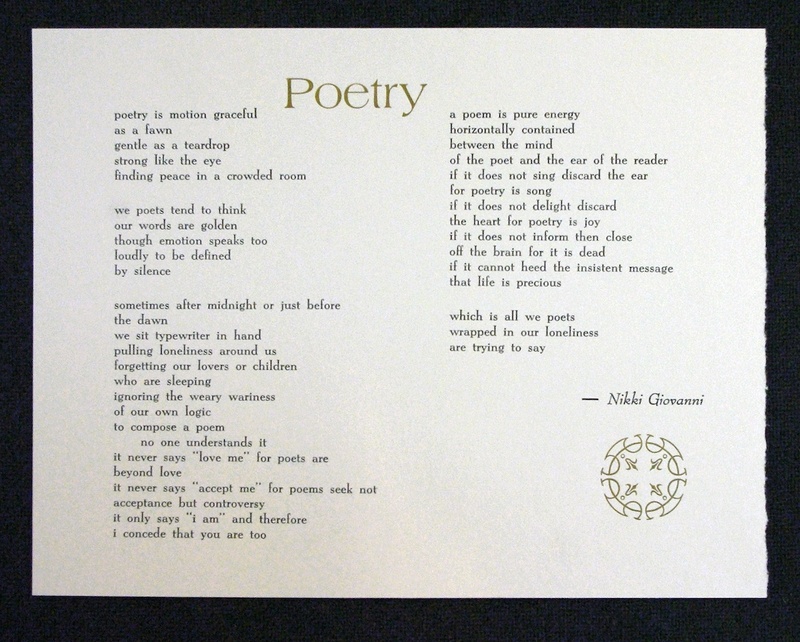 Last fall I started doing occasional ephemeral printing for the National Writers Series and started with a poem for Nikki Giovanni. 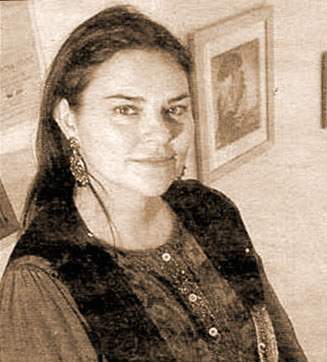 Now, with very short notice, I’ve received the “go ahead” from Diana Gabaldon’s publishers to do something for her evening of conversation at the Traverse City Opera House with the NWS. But I only have 7 days to do it. Ah well, deadlines are fun, right? Right? 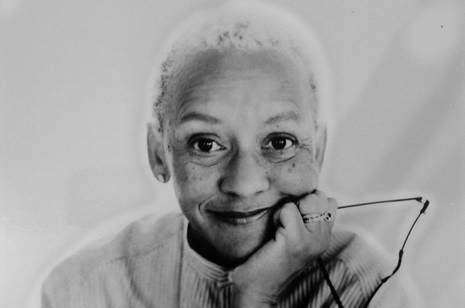 Diana’s famed series began in 1991 with her first novel, Outlander, which became a wildly popular historical, sci-fi, adventure, romance, non-fiction, and fantasy series. Readers have been hanging on the edge of their seats ever since for the next thrilling installment of Claire and Jamie’s story. The seven book series has sold more than 20 million copies and a television series based on the Outlander series is currently filming and will premiere on Starz network later this year. It was a longish, winding close, and the printshop was at the foot. There were thriving businesses and tenements on either side, but I had no attention to spare for anything beyond the neat white sign that hung by the door. It said beneath this, Books, calling cards, pamphlets, broadsheets, letters, etc. I stretched out my hand and touched the black letters of the name. 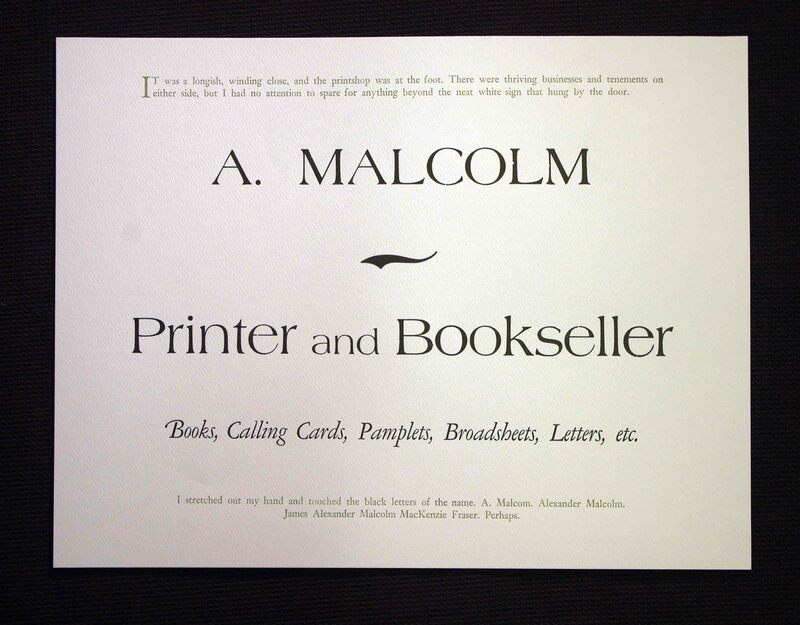 A. Malcolm. Alexander Malcolm. James Alexander Malcolm MacKenzie Fraser. Perhaps. What do you think? Captures enough of the essence of the series to be a memorable little bit with the first reunion between Jamie and Claire? Do you have a better suggestion? I need it quick to start playing with type and composition! The Traverse City National Writers Series was started back in 2009. Since its inception over 70 writers of note from around the world have come to Northern Michigan to give readings in the Traverse City Opera House, meet the local book culture and perhaps ingest enough of our region to spark their imaginations in other creative ways. On July 7th Diana Gabaldon will have a conversation with a host and talk about her book series and then, of course, you can buy her books, chat a little and, if you’re lucky, get something signed. As a bonus for buying a book on this evening you will receive a copy of the little broadside I am making for Diana and the NWS in an edition of no more than 100. I’ve started a little partnership with the Traverse City National Writers Series which was started by Doug Stanton (and a couple others) back in 2009. Since its inception nearly 70 writers of note from around the world have come to Northern Michigan to give readings in the Traverse City Opera House, meet the local book culture and perhaps ingest enough of our region to spark their imaginations in other creative ways. This Wednesday on Devil’s Night Nikki will be giving a reading and then, of course, you can buy her books, chat a little and, if you’re lucky, get something signed. As a bonus for buying a book on this evening you will receive a copy of the little broadside I made for Nikki and the NWS. An edition of 100 broadsheets in two colors, composed in 14pt Egmont and Americana titling and printed on light grey Whiting Brockway stock. for more information and to purchase available books and broadsides. Casting display type on the Linotype. Page spread from The Frogs Who Wished A King by Aesop, versified by Clara Dotty Bates. The wood engraving and part of the type set up on the galley. Chained books at Chetham’s Library in Manchester, England where I was a speaker at a letterpress conference. One of the greatest dangers of work not getting done at DWP – a good hatch on the river! Opening spread for the Frogs Who Wished A King by Aesop, intaglio engravings by Chad Pastotnik.
. . . and charge the big hook jaws . . .
Fine Press Book Association An organization of individuals interested in the art of fine printing, formed with the goal of promoting the appreciation of beautiful books and printing skills. Books and Vines Musings on Classic Literature, Collectable Books, Fine Wines and a Sundry Other Things that Make Life Interesting. Wood Engravers' Network Since 1994, a group of printmakers, especially interested in wood engraving, have gathered and formed an organization called the Wood Engravers’ Network. The Book Blog A blog dedicated to collectible books by fine presses & other specialty publishers.